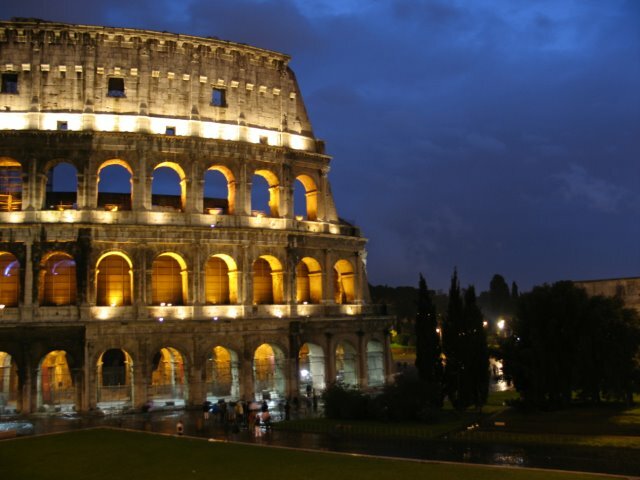 We have planned to see the Colosseum, the Roman Forum and the other ancient sites within the city today. However, we found out at the Termini Station that the entire Metro system - including bus and trains - have stopped operating due to a union strike. There we were at the station trying to figure a way as we did not anticipate a transport strike. Here comes Carding to the rescue. He looked at us and approached us, saying "kabayan, if you need a tour guide, I can show you around the city in my car, $5 for each of you an hour". Yes, Carding happens to be a Filipino based in Rome and works part time as a driver/guide for tourists. I figure that the price he quoted was a good deal - for 5 hours of city tour, we would be getting a driver/guide and a private car for only $25 each. What a relief to find someone like Carding. 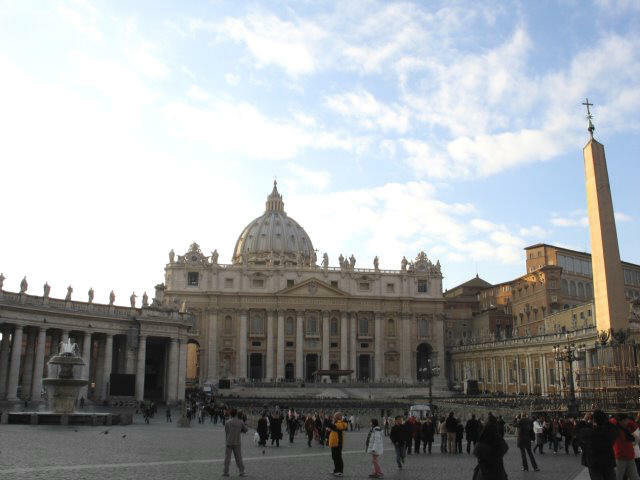 Rome must be so close to heaven that our prayers are answered pronto! I was seated at the front while Ate Emma, Leah and Sonny took the back seat. Carding brought us first to the small but very old church of Sta. Prassede, near the mammoth Santa Maria Maggiore basilica. Sta. Prassede has ornate mosaics adorning the altar. But what really caught our attention was a relic that was brought from Jerusalem: the pillar where Jesus Christ was said to have been scourged. Some do question its authenticity but you can not question the gleam in the eyes of faithful Catholics who gravitate to this part of the church. 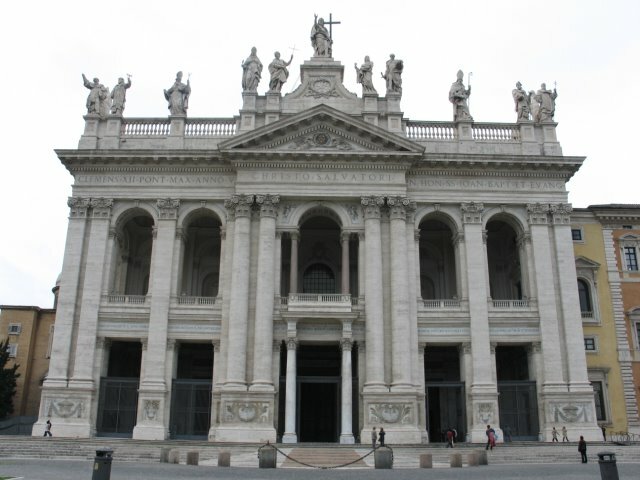 Carding tells us there are four patriarchal basilicas in Rome: San Pietro in Vaticano, San Paolo Fuori Le Mura, San Giovanni in Laterano and Santa Maria Maggiore. 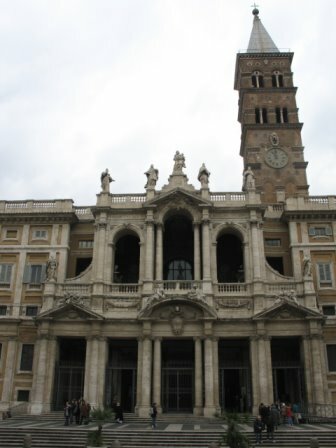 We visited Santa Maria Maggiore and was awed by its sheer size. We felt like dwarfs as we moved through its cavernous naves and altars. Carding drove us next to the Basilica de Santa Croce, a church dedicated to the Holy Cross in Jerusalem. What really made this church well-known is the Chapel of the Passion Relics which contains a glass-enclosed display of relics allegedly brought by St. Helena from Jerusalem: a thorn (from Jesus´ crown of thorns), a nail from the crucifixion and part of the title of the cross where Jesus died with the words "Jesus of Nazareth". 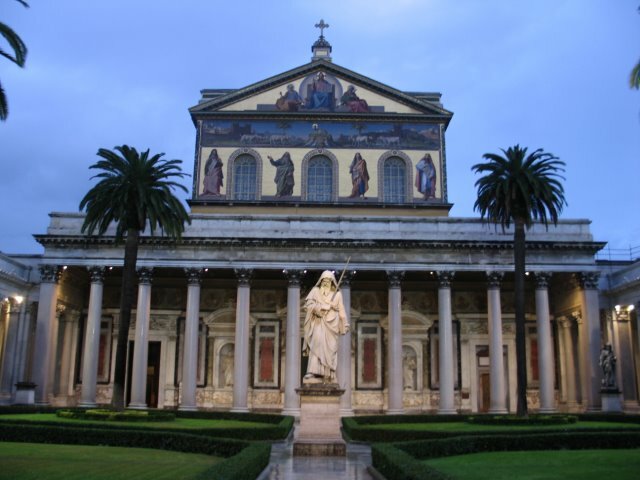 As we went to the other two basilicas, the San Giovanni in Laterano and the San Paolo Fuori Le Mura, I felt the Italians truly have a huge appetite for architectural endeavors. 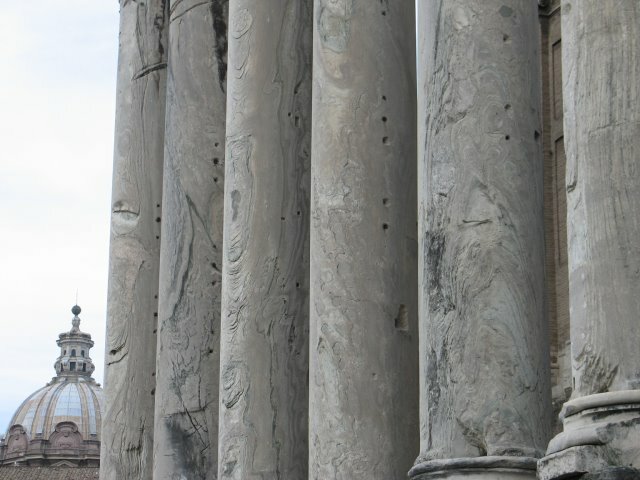 These basilicas are testaments of the skill and artistry that must have been driven by a strong Catholic faith as well. I guess if faith in God had anything to do with size, might as well show to the world that theirs is the biggest. The sky was gray as we arrived at another Rome landmark, in fact Rome´s iconic landmark - the Colosseum. As I look at this huge structure, I began to imagine the many bloody battles staged in its arena as gladiators and wild beasts fought it off to death while thousands of Romans up on the bleachers watched the carnage with glee. Obviously, the Colosseum has not lost its appeal as tourists lined up for the long wait just to see what´s left of it. Men costumed like gladiators pose for the camera-wielding visitor, never mind if this appears too goofy. The Roman Forum is next to the Colosseum. However, Ate Emma felt she couldn´t hurdle another ordeal of a walk-about around the vast ruins scattered in the center of this Eternal city. Leah, Sonny and I hit the ancient alleys where Julius Caesar once walked, trying to feel the richness of history embedded in the stones. 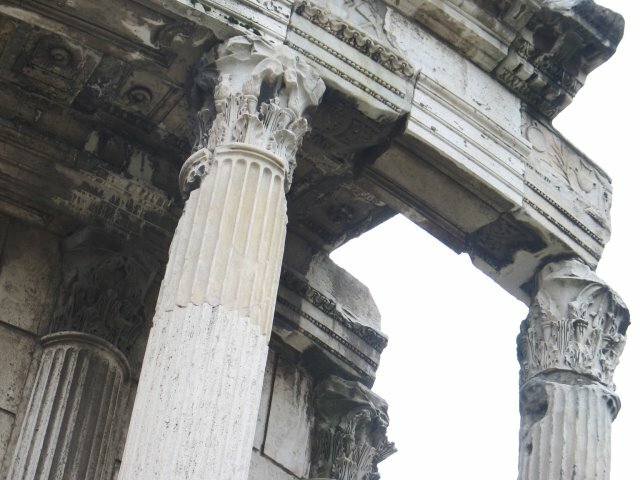 The ruins at the Forum is what's left of what used to be the center of politics in ancient Rome. 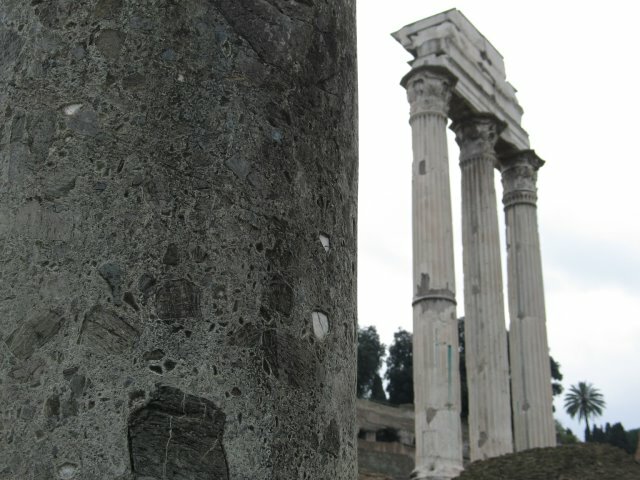 I could hardly picture the grandeur as most of what's standing are marble columns and stones strewn here and there. 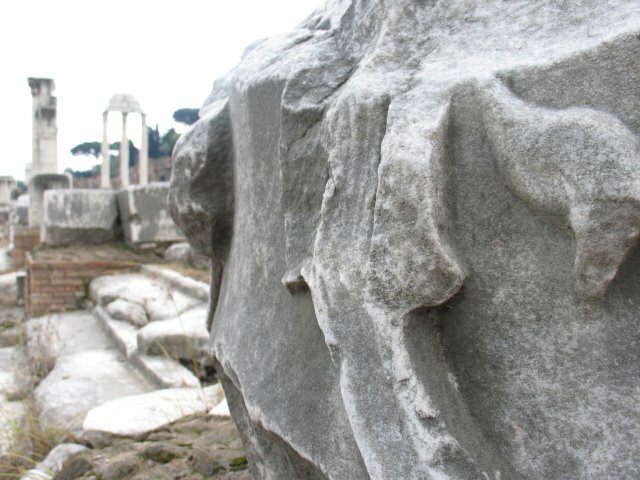 Nevertheless, the ruins provide a glimpse of what was once the site of a mighty empire whose tentacles of power and influence reached as far as the shores of Bosphorus and the Red Sea. This time around, hordes of tourists are invading this ancient site which compared to present-day Rome, is actually on a lower level of ground (think of all that silt that has been deposited all these centuries).